Now available! 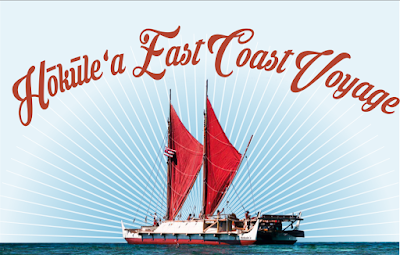 Click here to view the schedule for Hokule'a's East Coast visit. I can't wait! :D That's kind of an outline version with bigger events; for day to day info, follow the links they have over there to their Facebook page (great updates, I've been enjoying those so much) and their live tracking map. BTW, for West Coast friends who might be feeling left out, you may be getting a visit from Hokule'a's sister wa'a, Hikianalia; if you look at the map at Hokulea.com, the light blue line is her sailing down the West Coast to meet Hokule'a in Panama before they sail home to Hawai'i together later in 2016. There aren't any details yet but keep an eye on that page for updates. Can you even imagine the welcome-home party they are going to throw when Hokule'a gets back home to O'ahu after this amazing journey? Aren't they splendid? Buying a ticket was a little bit of a gamble with work being the way it's been, but I made the gamble, it all worked out, and I'm so glad I was able to attend. Thank you to all the performers, to Halawai for organizing, and to the various sponsors for the wonderful food (the gentlemen from Noreetuh pulled out all the Hawaiian stops for this one, omg SO ono! )& drink. What a fantastic evening in honor of Hokule'a's journey! There are a few fun things to do coming up here soon - unfortunately for me, I'm in the middle of what I think I'm going to start calling the march of March, working in a financial position as I do my job is very calendar-driven and March is always the busiest month, so chances of my getting to these is slim - but I thought I would share 'em here. I'm actually going to start with one that's way way way outside of my usual area for event announcement - but I wanted to share it anyways because OH MY GOSH IT'S THE HOKULE'A'S FIRST US EAST COAST EVENT! WOOHOO! Hokule'a just arrived in Florida yesterday, having left Cuba early in the morning. She's in Key West now, according to her live tracking map, where she's going through customs, and then she'll continue north to Everglades City, where the first public event here on the US east coast will be held this coming Saturday, the 26th. Click here and scroll down the sidebar on the right for full details - and if you are somewhere along the East Coast to the north of there, keep an eye on that spot for announcements of events as she travels through your area! There are 2 Hokule'a related events coming up. The first is Island to Island, a fundraiser featuring food by Noreetuh, beverages featuring Hawaiian rum by Julie Reiner, and wonderful live entertainment. Halawai, the Hawaiian cultural organization that's coordinating the NYC welcome, is putting on. Next up in the Hokule'a set is a pair of panel discussions about the resurgence of indigenous knowledge, like the Polynesian wayfinding skills that were nearly lost during the 20th century. Should be fascinating! This is being held on Thursday, March 31st at the New School at NYU, afternoon session from 1 to 3, evening from 6 to 8. These are free but please click here to RSVP. Then on Saturday, April 2nd, there's another fantastic fundraiser, the Ghost Ship Ball at the House of Yes in Brooklyn. 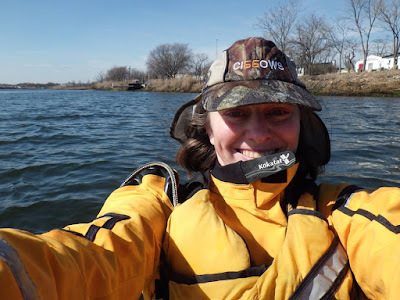 This one's for the North Brooklyn Boat Club and the Long Island City Community Boathouse, two really excellent local paddling clubs who have lined up an evening that sounds like crazy good fun - click here for details and tickets. Now I feel like there is something else but I can't think of what it is right now. I'll come back and update if I do! My picture of Sunday's lone scaup in Sheepshead Bay made me want to draw so I did this before I came to work this morning. Pen and ink on the back of some random piece of insurance paperwork. 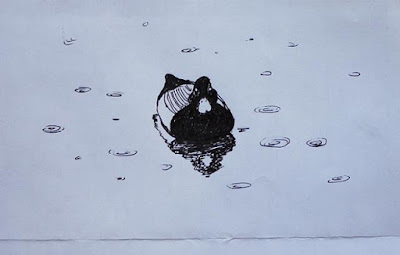 OK, so it may be snowing out there, but the oystercatchers are back, I saw my first flock today. They're a springy thing even if the weather doesn't feel like it. So glad I got myself out for a beach walk - it was a long long week with too much work and body complaining a bit about chemo round 7, but after a very lazy day of hanging out with TQ while nursing a grouchy tummy yesterday, I was feeling a little more rested, and although the Evil Futon of Nap did nearly take me down, I fought my way out of its comfy clutches and headed out to Sheepshead Bay for my annual winter duck walk. After stopping beside the bay, I decided to walk a little way down the beach towards Gerritsen Creek. Looking back toward Kinsborough College and the inlet to Sheepshead Bay. My original plan had been to walk a little ways down the beach, then turn around and walk to Brighton Beach and take the train home from there. But it was so nice and peaceful heading out towards Plum Beach that I decided to keep walking that way instead. It wasn't the springiest first day of Spring ever, but that meant very few other shorewalkers - I really had the place to myself for most of my hike. This ended up being a great call - I was rewarded with oystercatchers, just outside of Gerritsen Beach, at the inlet to the marsh behind Plum Beach. I'm always so happy to see my first oystercatchers of the year. These are one of the first summer birds that I notice returning this time of year and when I see them and the ospreys, I know summer's really on the way. Skimmers mean summer's HERE. I think this flock must have just arrived from their flight from the south. Usually you hear oystercatchers before you see them, because they loudly and proudly proclaim their presence with shrill cries of "Wheet! Wheet! Wheetwheetwheetwheetwheetwheetwheet!". This flock was so quiet - thinking back, I think there may have been one single "Wheet!" that drew my attention, but then I sat down to watch them for a bit and there wasn't another noise out of them for the whole time. Never knew oystercatchers actually had it in them to be quiet, but if they'd just gotten in, they may have just been to tired to holler. I watched them for a little while and then headed back for Sheepshead Bay as snow began to fall. Snowy goodnight to the birds and the bay. Chemo - 7 down, 1 to go. Plus a bit of a trip report. Whoop! And how am I doing? Like this! OK, full disclosure, that was actually taken on Saturday, 2 days before Round 7; I just had round 7 today and I'm not feeling quite that chipper now. Still really not bad, though, really not bad. Carrying on, and so glad that I was able to get in a paddling date with my guy this weekend. Saturday was clearly shaping up to be a splendid day for a paddle by late in the work week, in fact so much so that TQ and I actually ended up typing emails to each other suggesting it at exactly the same time on Friday (he got mine just as he was about to hit "send" on his and quickly changed it to a "hellzyeah!"). Nothing fancy, just out and around Ruffle Bar and back, although that ended up being a longer paddle than usual, as we ended up being out at low water and it was just a few days after the new moon and so Ruffle Bar was a lot bigger than it sometimes is! Probably about 7 miles, maybe a little more, nice paddle though, we enjoyed it thoroughly. I'm chained to my cubicle again this week so I'll share a few more photos in a couple of days. The crocuses and the dramatic sky were both from Saturday, of course. I was delighted to see the crocuses, I'd hoped to go out to Glenwood, where I'd seen some sprouting a titch too soon (right before that brief cold snap), to see if they'd made it through (crocuses are pretty sturdy), but hadn't made it over there yet. That meant the club crocuses were the first I'd seen in full bloom this spring. Weren't they so lovely with the sun lighting them up? It was a good thing I took pictures before we launched. I tossed up the sky-and-water shot right after paddling on Saturday, I stopped at home to shower and clean my gear before heading back to TQ's for dinner, and I didn't want to make him wait around while I blogged a whole trip report, but I couldn't resist sharing that one (and yes, I put up a few on Facebook, too). As you can see, there was a major shift in the weather's mood from when we set out to when we returned (Saturday's sky and water shot was taken as we were getting back to the Paerdegat), and it was actually really neat with the weather starting out like you see here, blue sky and sunshine la la la, and then these dramatic clouds coming in as we paddled. Great day on the bay. 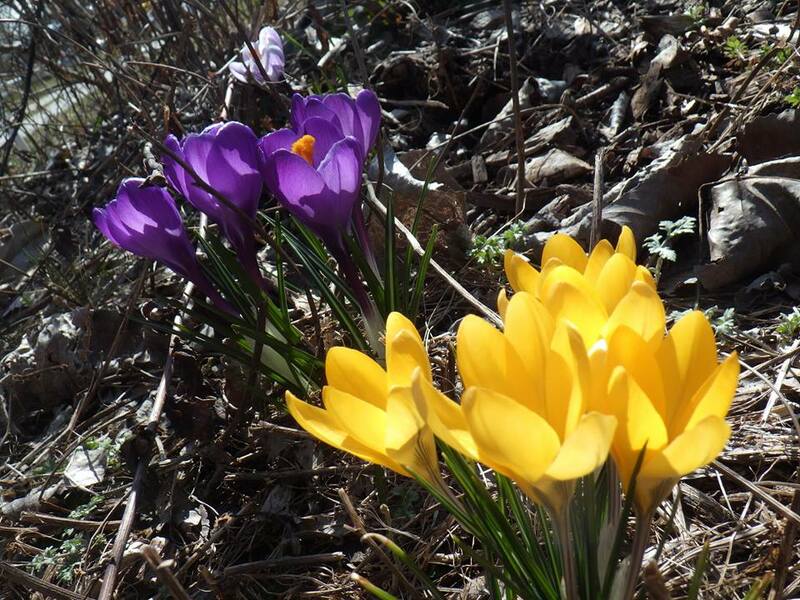 And also on 3/12/2016 - Sebago crocuses! My Hope For Today - Let's All Be Safe Out There. May everyone who walks outside into this balmy springy day and decides to dust the winter cobwebs off of the boat and get out for a paddle have the good sense to wear their lifejackets, at the very, very least. We are still in the time of year when here in NY State it is legally required for anyone out in a recreational craft of 20' or less to be wearing a properly fitted lifejacket. This is a very good rule for a good reason. See any of my off season/cold water boating links in the sidebar to the right for more information. 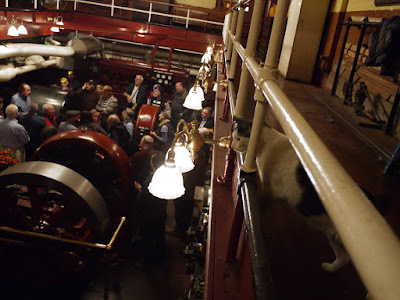 As a member of the Ship Lore and Model Building Society, sometimes affectionately known as the "SteamGeezers", I was very happy to get an invitation to the 80th birthday party that was was recently thrown for Conrad Milster, Chief Engineer at Brooklyn's Pratt University. 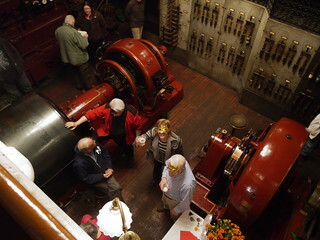 The party was held at the Pratt steam plant, an amazing place with steam engines dating back to the late 1800's. I've been hearing about this place for ages, so I was very happy to accept, and it was a wonderful party and Conrad even started up one of the antique steam-powered generators for us - that was really something to see (and hear, I was trying to imagine the sound back when the generators would all be fired up and running). The photo above is my favorite from the evening - in addition to his oversight of the beautifully restored steam plant, Conrad is famous for his love of cats, and a small pride resides at the plant. Collectively, they are of course known as the Pratt Cats - we all wore sequined cat masks to get into the proper spirit! I was delighted to catch one of the Pratt Cats overseeing the activities from above as Carolina from PortSide NewYork raised a toast to the Chief Engineer. Conrad and The Steamplant from Dustin Cohen on Vimeo. Once I had the roast, all I needed was a recipe, so I did some internet browsing and decided I liked Sam Choy's recipe. Most of the recipes for imuless kalua pig are pretty straightforward, involving 'alaea salt, liquid smoke, and a long cooking time at a low temperature. Many would have you rub the liquid smoke straight on the meat, though, and I didn't like the sound of that, especially since I'd never used liquid smoke before and had read that a little goes a very long way. Sam Choy has you mix a little of the liquid smoke with water and pour that over the meat after you've taken it out of the oven and pulled it apart. That sounded much more controllable and even so I went with that one. It was a fortunate thing that I had picked up a little tin of 'alaea salt (sea salt mixed with a mineral-rich red volcanic clay) at the Kapiolani Community College farmers market when I went home last July for my 30th high school reunion. There's a good chance they would've had this at Dean & DeLuca, the fancy grocery across the street from my office, but it was nice to not have to go hunting for it. 'Alaea salt. Isn't it pretty? The other semi-exotic ingredient that Chef Choy's recipe called for was a banana leaf. Fortunately I was over at TQ's when I was looking at the recipe, and he was pretty sure he'd seen banana leaves at the R&R butcher shop on Courtelyou Road. He was right, and this totally cracked me up - they come frozen in a 13" x 11" flat package, and never having cooked with banana leaves, I was thinking that there would be a stack of cut-up leaves in the package, sort of like the way nori for sushi comes in squares - well, it turns out that there's an entire folded-up banana leaf in there! It was taller than I am! Ti Grows in Brooklyn was also kind enough to donate a few leaves to the cause, just for authenticity. Ti leaves are the food-wrapping leaves of choice in Hawaii, and a ti plant's bottom leaves are shed as new leaves pop up as a spike in the center - I just picked the bottom leaves that were starting to turn brown at the tips a little sooner than I usually would. Hi Ti! (Ti says hi). All wrapped up like a giant lau lau! I actually had made a stop at my favorite local West Indian greengrocer to see if they had taro leaves, which I found out from a friend not too long ago are sold under the name "dasheen bush" at the Caribbean greengrocers. My local one does have it from time to time but not today - I was thinking of making squid luau, which is taro leaves simmered in coconut milk with squid, very delicious and a nice contrast to all the salty pork I'm feeding my friends on Tuesday - no luck there, though. Giant lau lau goes in the imu hao - that's not the real Hawaiian term for a dutch oven but "imu" is a pit oven and "hao" is iron. I made this up after a friend from Hawaii talked about cooking kalua pig in his imu one time on Facebook - I was all impressed thinking he'd gone out and dug a pit and heated up the stones and everything and then he revealed that he'd nicknamed his slow cooker. I figured if a slow cooker can be nicknamed "imu" then I can call my dutch oven "imu hao". This was the one place I diverged from the recipe - Choy says wrap the roast in tinfoil but I figured with the Dutch oven that would be superfluous. This was a Christmas present from TQ a couple of years ago and when I go to do something like this, I'm always glad he gave me the big one. I can't get over how perfectly the roast fit the Dutch oven. The unveiling. Oh boy, looks great! This was a good sign - the roast started falling apart entirely of its own accord as I started unwrapping it from the leaves. Finished the job with a pair of forks. Liquid smoke diluted in water added; cabbage ready to go (OK, actually the Sam Choy recipe didn't add this step but kalua pig is frequently served with cabbage mixed in). Kalua pig and cabbage - too much to fit in the pan in the end so I had to dish some up for myself for dinner! Shucky darn. I was a little bit worried about serving something to my friends at Sebago when I'd never tried the recipe before, but this worked great. Mahalo, Chef Choy! I also couldn't resist making spam musubi, as people at the club have occasionally expressed interest in my making this for a potluck. I decided to make mini-musubis; I also tried to figure out a faster way to make the rice cakes than cutting out the bottom of the Spam can and using that as a mold - you can buy a musubi press in the proper dimensions but I always think of that as I'm actually making the musubi. Using a 9x9 cake pan actually worked OK - the musubi are a little ragged-looking but it did speed things up a bit. I made a LOT - hope people like 'em or I'll be eating spam musubi for lunch for the rest of the week. Wait - what would be wrong with that?